The 5th anniversary of Sensei Hidetaka Nishiyama’s passing falls on November 7, 2013 He was a leading human and the charismatic leader of world traditional karate. 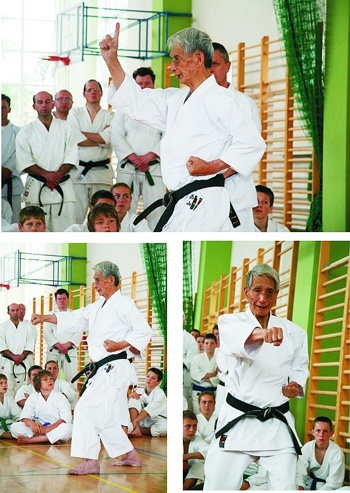 Sensei Hidetaka Nishiyama was born in 1928 in Tokyo. He began his karate training in 1943 under Gichin Funakoshi, founder of modern Shotokan karate and later he continued his training at Takaushoku University. Sensei Hidetaka Nishiyama was a founder and first President of the ITKF. His first objective was to have Traditional Karate as part of the Olympic Family. He is the creator of new categories of Traditional Karate competition (fuku-go - contest in which each competitor takes part in two events, a synthesis of kata and kumite in one event and en-bu choreographically directed kumite). He is the author of many works about Traditional Karate, his best known being - "Karate, the Art of Empty Hand Fighting" which was published in 1960 and even today, is considered the definitive textbook on the subject of Traditional Karate. It is believed to be the best-selling karate textbook in history. He was undoubtedly the man on whose shoulders, for many years, carried the responsibility for passing Traditional Karate to the next generations. He believed there was always more to learn and more to improve and he lived his life in the continuous search of that knowledge and development. He passed away in November, 2008 at the age of 80 years. On October 10, 2009, Mr. Richard Jorgensen, Chairman of the International Traditional Karate Federation presented Sensei Hidetaka Nishiyama with his 10th Dan posthumously.